Choice is a good thing. But with so many trails to choose from, researching ahead of time doesn’t always paint a clear picture of which trails are worth our time. On our last day in the Tucson Mountain (west) district, we only had a half-day, since we planned to drive to Benson, AZ to begin a backpacking trip the following day. With a limited amount of time, and only an inkling of which trail we wanted to do, we went to Red Hills Visitor Center to ask for a recommendation. We spotted an available park ranger and volunteer, so we asked, “What interesting short hikes do you recommend?” And we got blank stares. Typically, staff and volunteers go out of their way to help visitors, but that wasn’t our experience here. It seems neither was even interested in hiking, nor were they that willing to look up information. Slightly perturbed, we decided to look elsewhere. On our way out, we noticed a poster listing good hikes to do that season. Clearly someone at the VC does care enough to post the info. After perusing the list, we decided on Ringtail Trail, since it claimed to feature wildflowers in spring. Perfect. We also discovered that a ringtail is a mammal, similar to a raccoon, that lives in the southwestern United States. 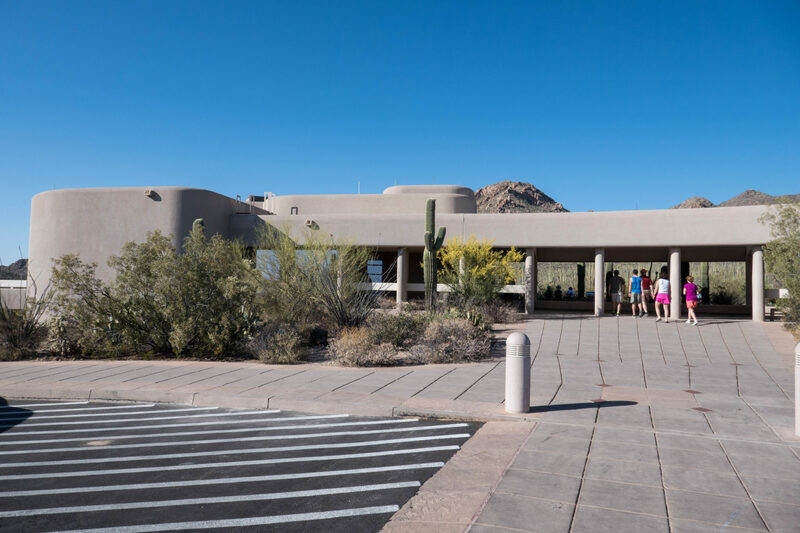 Before we left the visitor center, we decided to watch their video, “Voices of the Desert.” The video had some photos of cacti and other plants. 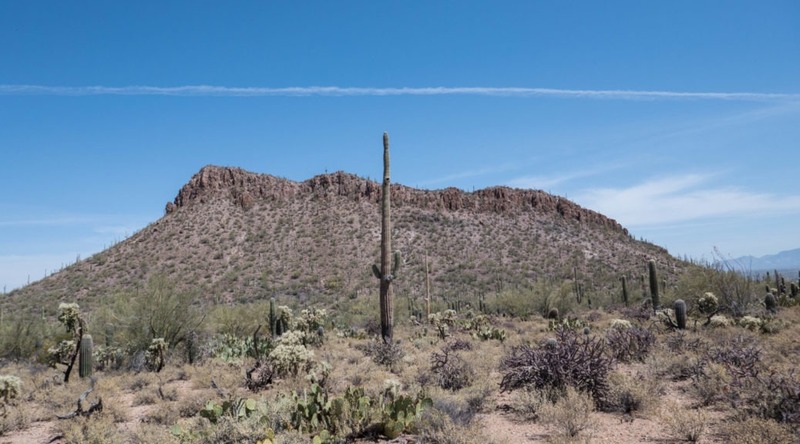 It discussed the geography and biology of the region, and presented a poignant perspective from the indigenous Tohono O’odham Native American tribe. There’s even a surprise at the end of the video. I won’t spoil it for you, but it’s definitely worth the time if you visit! The following day, we drove to the trailhead. It’s in the northern part of the West District, and took some time to get to. We drove through the southern part of the park, past the visitor center, past the Bajada Loop, past a small gas station with a Subway, and (finally) onto Picture Rocks Road. The road cuts right through the park, and it seems a lot of people just use the road to do just that. 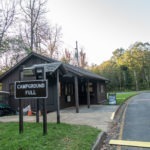 As we drove, we passed the Cam-boh picnic area on the right, which has the closest restroom to Ringtail Trail. On our left, we saw Panther Peak. 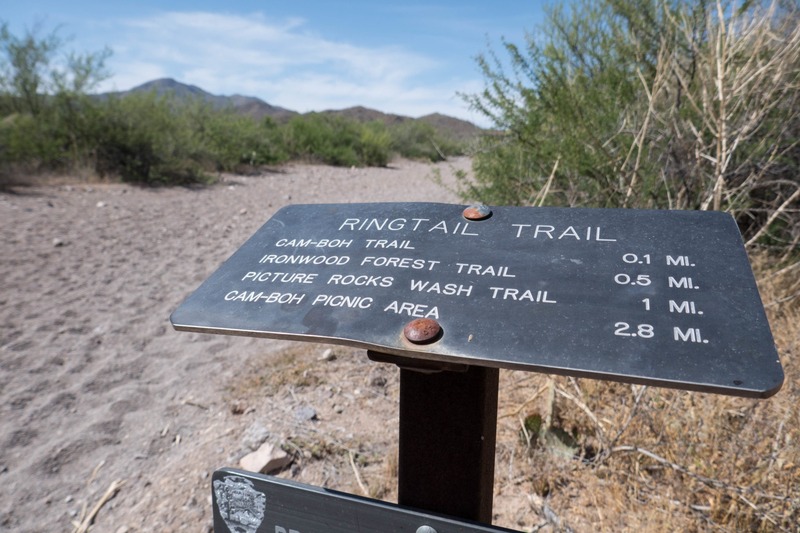 There’s no trail that goes up to it, though a ranger had mentioned a social trail – but the park discourages its use. It’s too bad, because it looks like a fun hike. The map indicated that we should park at Box Canyon parking lot, but it isn’t well-marked. We initially pulled onto the shoulder, thinking we found it, but saw no signs or trailhead markers. We continued driving, and found the lot a bit further up, on the left if you’re driving east, where the road curves. The hike begins in a wash across the street. We started hiking at 11am (we’re not early risers), but would recommend starting much earlier, because it was HOT. This 3.4 mile loop includes several named connector trails. We weren’t sure what to expect – possibly a hot, over-exposed walk in deep sand – but we were pleasantly surprised. The hike begins in a wash on the titular Ringtail Trail, but we were treated to very nice views of Pictured Rocks on the left. In a short 0.1 miles, the trail splits. Cam-Boh Trail goes to the right; we turned left to continue on Ringtail trail, which becomes a true trail rather than a wash.
As we hiked, we kept an eye out for wildlife and wildflowers, and we were soon rewarded with both. 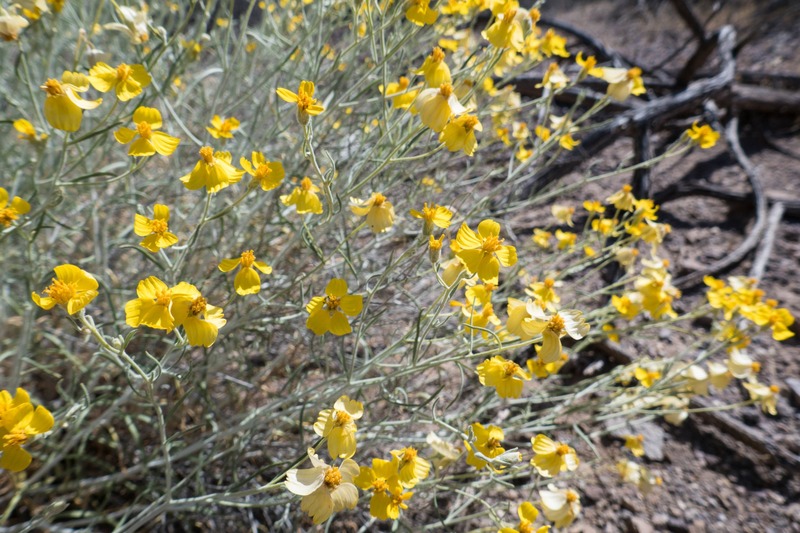 First, we saw some pretty yellow wildflowers on a shrub beside the trail. I’m not up to date on my western flowers, but I looked it up when we got home and found out it was a Whitestem Paper Flower. Nearby, we spotted a rabbit weaving in and around the saguaro and cholla as we passed by. 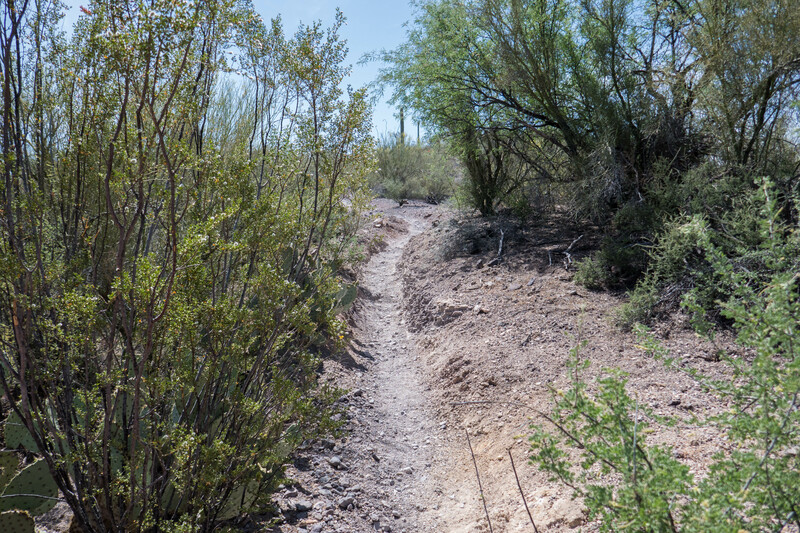 As with most of the trails in Saguaro, we also spotted plenty of lizards skittering across the path. 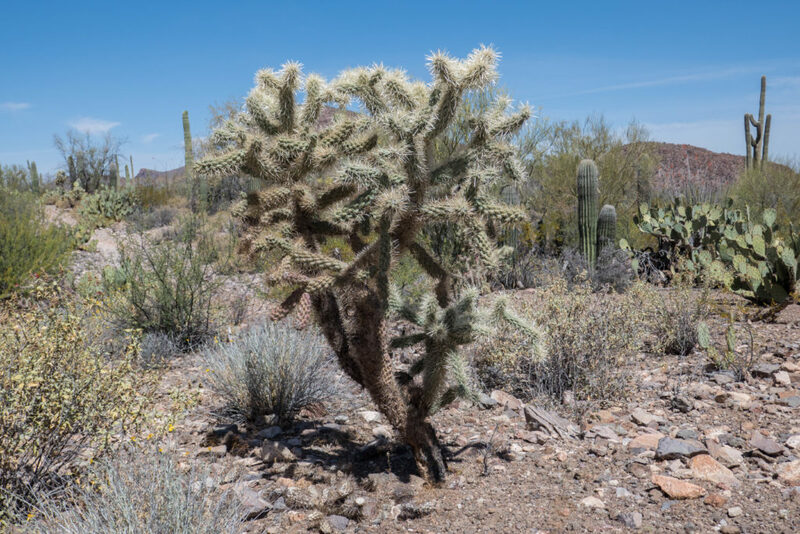 This is a cholla cacti, not sure what variety. Watch out for any detached spiny segments – these will latch on to your clothing! 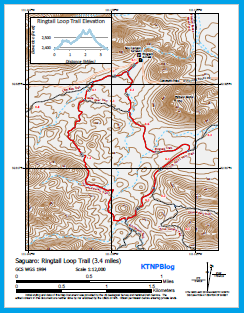 We hiked on Ringtail Trail for 0.9 mi before turning right onto Picture Rocks Wash Trail. Given the name “Picture Rocks,” I imagine there are (or were) petroglyphs somewhere, but we didn’t see any. Walking in sand takes more effort than other types of terrain, and this loop continually switches between a trail and a wash. The wash was hot, but thankfully there were a few trees, like Palo Verde, that provided momentary shade. As we continued, we found an optimal place to stop for a break – a small rocky outcropping that looked like a tiny canyon. This would have made a great lunch spot, too. Soon after the canyon, we reached Ironwood Forest Trail, the final segment of our hike. Once again, we were on a path rather than a wash. 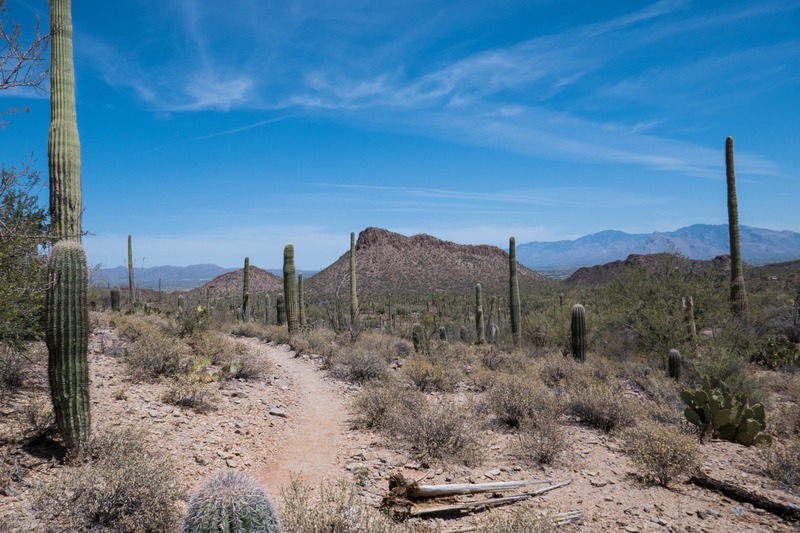 It is an enjoyable trail, with good views of mountains and cacti. 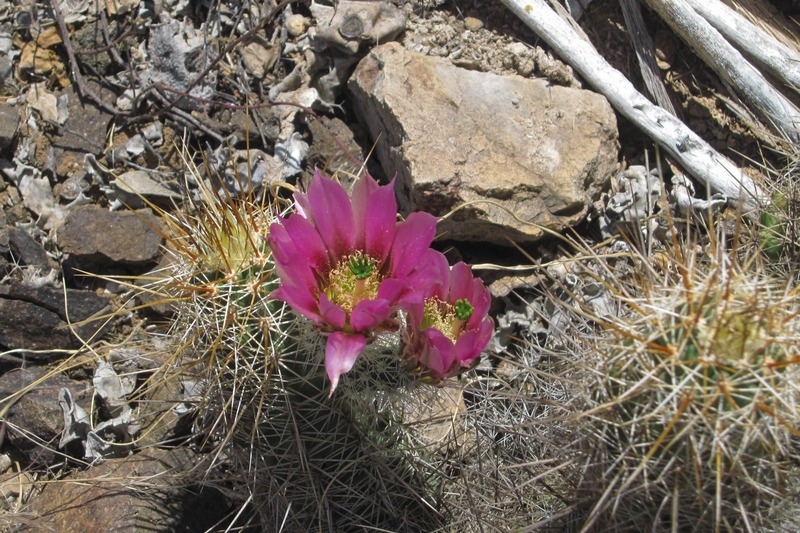 We also found a Saguaro with a single blooming flower off the trail. 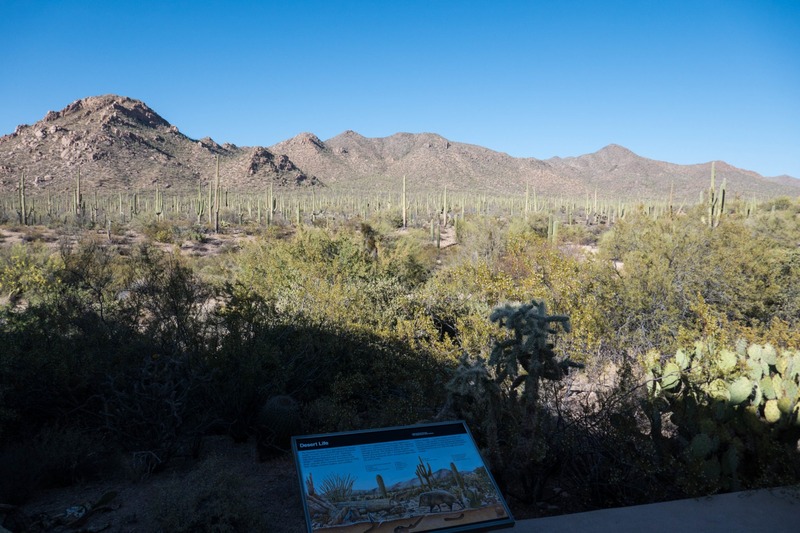 Saguaro typically bloom from April to June, and we visited at the start of the season. 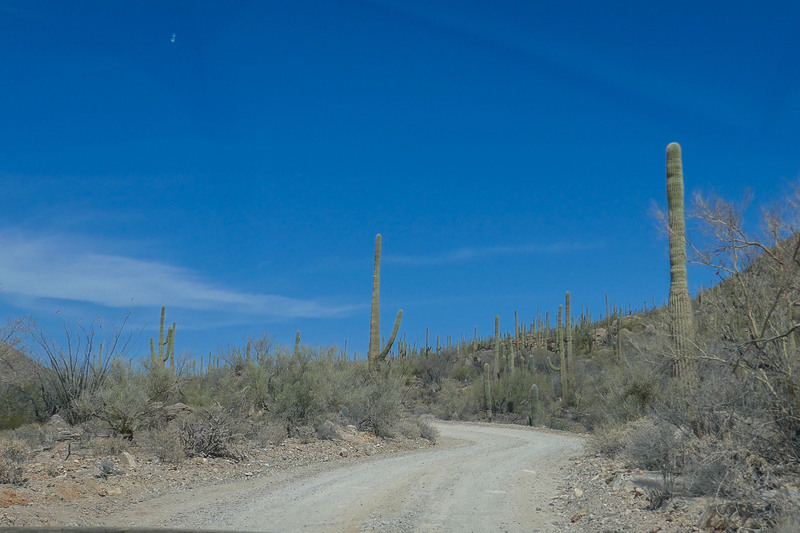 We only saw a few blooming saguaros during our trip. I wish we had seen many more, particularly flowers that were lower to the ground to photograph. 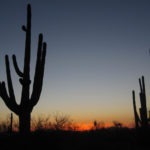 The ones we saw were at the top of the saguaros, though perhaps there is a reason for this. Ironwood Forest trail leads to Cam Boh trail, which goes for 0.2 miles, back to the start of the loop. And then it was only a 0.1 mile walk back to the Box Canyon parking lot. We were tired, and ready for some lunch. We headed back to the Subway we had spotted earlier to grab a quick bite. As we ate, we agreed this hike was surprisingly interesting, with a variety of scenery and wildlife. A view of Picture Rocks Wash Trail. It’s somewhat challenging hiking on the loose sand. Try not to get too much in your boots. 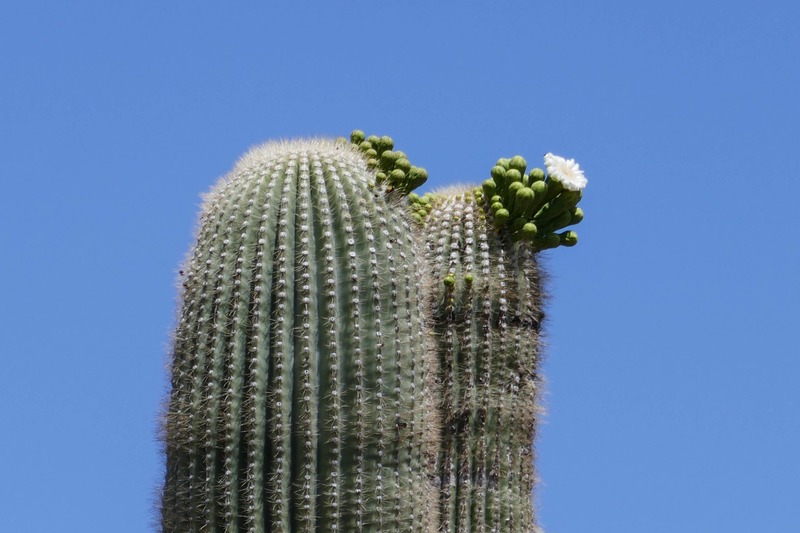 Lonely flower and buds at the top of a saguaro…imagine what it looks like when all are in bloom! After our lunch & AC break, there was one more thing we wanted to do before saying goodbye to the Tucson Mountain District. We wanted to drive the Scenic Bajada Loop, and hike the short Signal Hill Trail to some petroglyphs. Research told us the drive is unpaved, but provides great views of the desert landscape. We had also read that the road is bumpy, but 4-wheel drive is optional. Since we had rented a higher-clearance SUV, we figured that would do. Since some sections are one-way, we started the loop in a clockwise direction. The dusty drive seemed…a bit underwhelming. 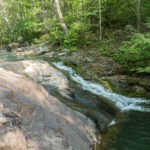 The wildlife and views were similar to what we’d just seen on our hike; it might be meant for visitors who are short on time or not into hiking. The real reason to drive the Bajada Loop though? 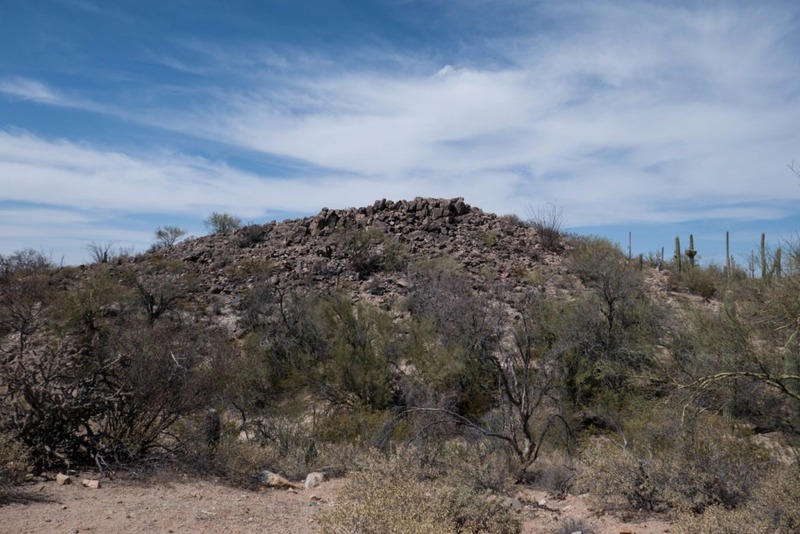 It leads to Signal Hill Trail, the largest petroglyph site in the Tucson Mountain District. 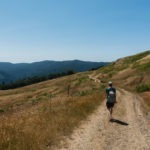 The trail is only 0.5 mi round trip, and leads up a rocky hill. 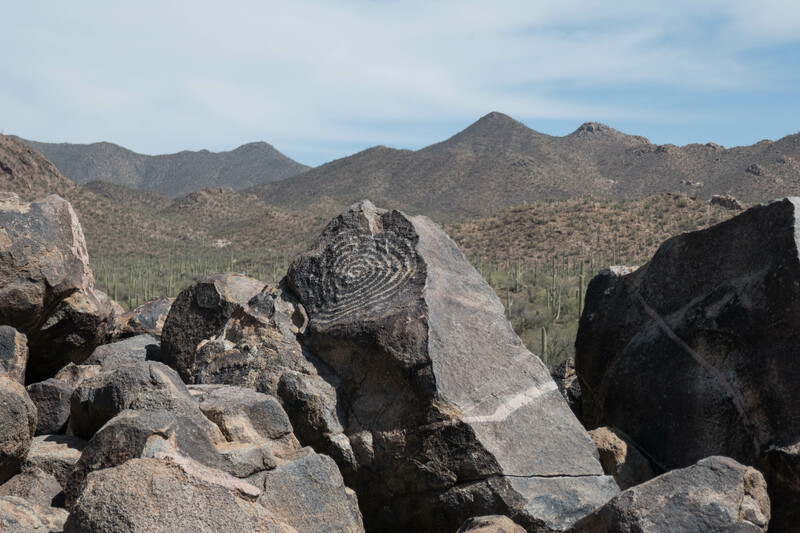 There are dozens of petroglyphs, and some of the best are at the top. 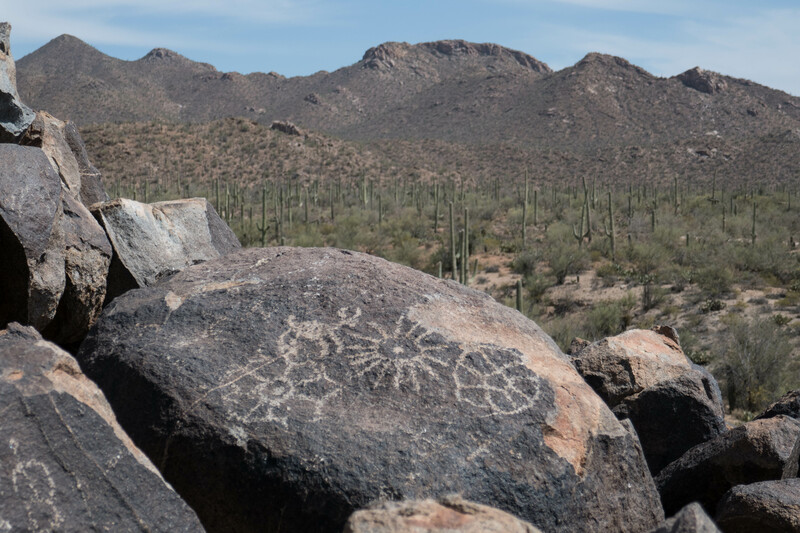 The petroglyphs are estimated to be around 800 years old, and were created by the Hohokam people who inhabited the Sonoran Desert from around 450 A.D. to 1450 A.D (NPS Article). The trail and petroglyphs are very interesting and well worth a visit. The spiral petroglyph at the top was my favorite. On our way out, we stopped at Red Hills Visitor Center one last time to fill up our water bottles (they have a nice bottle filler we recommend). We spoke with another park ranger there, and found her to be more informed and helpful than the ranger from the previous day. Confidence somewhat restored. While there, we couldn’t resist buying some some prickly pear jellies. They tasted like a combo of grapes and raspberry – when in Rome! Then, on to our next adventure: Manning Camp. Mile 0.0 – After parking, cross the road to reach the trail. You’ll start in a wash.
Mile 0.1 – At the fork, keep left to continue on Ringtail Trail, and out of the wash.
Mile 0.4 – Continue straight on Ringtail Trail (you’ll pass Mule Deer trail on the right). Mile 1.0 – You’ve reached the end of Ringtail trail; turn right onto Picture Rocks Wash Trail. 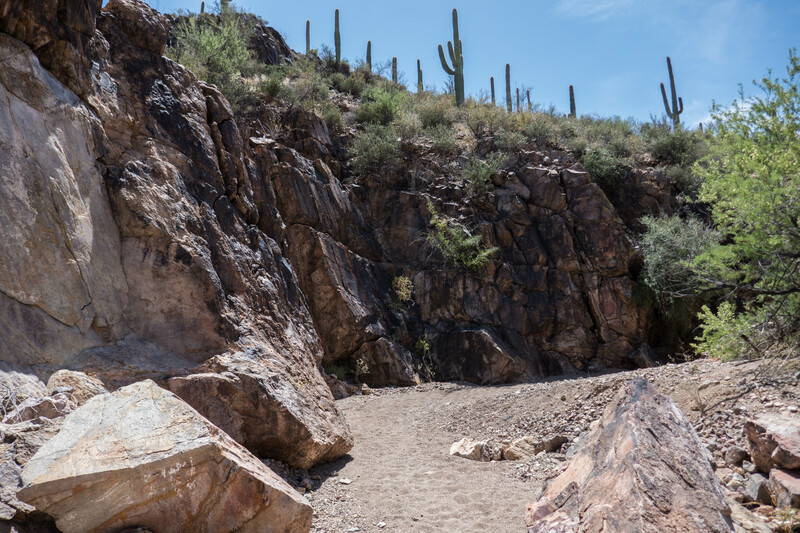 Mile 1.7 – After passing through a canyon-like rock formation, you’ll turn right onto Ironwood Forest Trail. 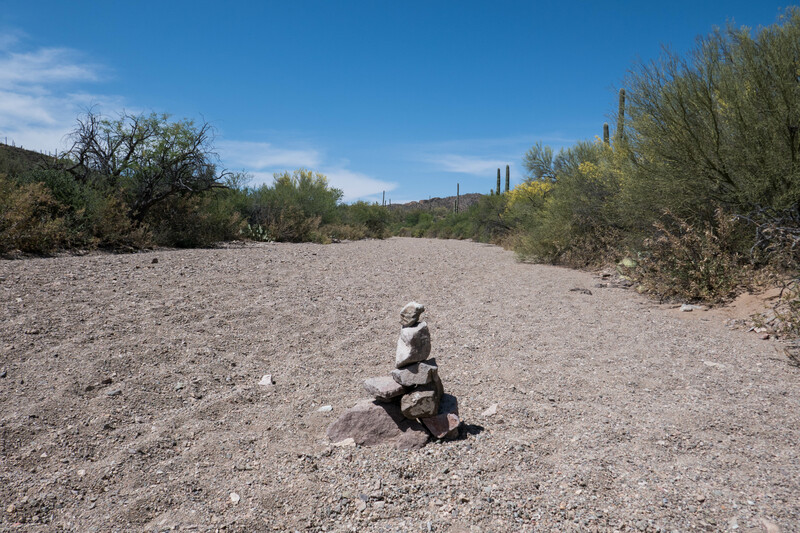 You’ll head north, and out of the wash.
Mile 3.0 – Ironwood Forest Trail ends; turn right onto Cam-Boh Trail. 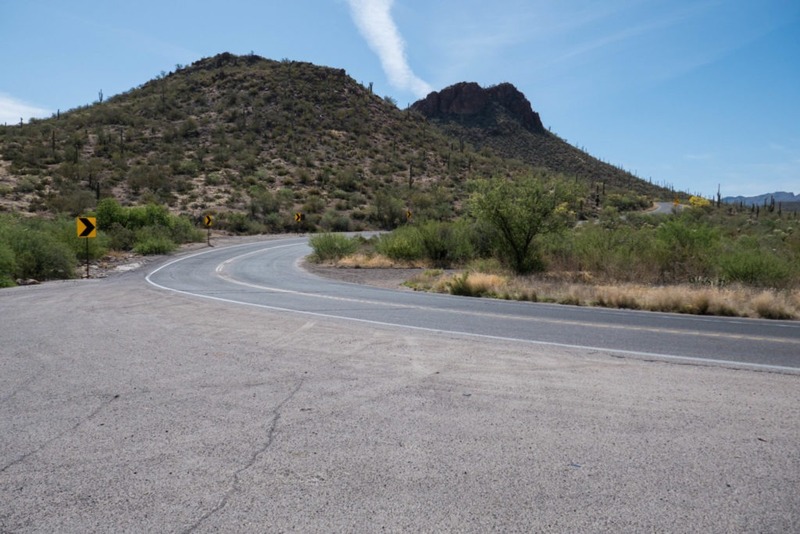 Mile 3.2 – You’re back at the intersection with Ringtail Trail. Turn left to head back to the parking lot. Mile 3.3 – Done! You’re back at the trailhead. 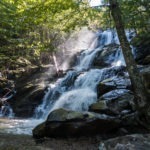 Date Visited: It took us awhile to blog about this trail. Luckily we take detailed notes! We visited Ringtail Trail and Signal Hill on April 16, 2017.